I know this movie came out maybe 3 weeks ago but I hadn’t seen it. I kind of wanted to see it because I like Anne Hathaway but I also didn’t want to because it just looked ok and I would have had to pay for it because there was never a screening for it. Anyway I was dragged (just kidding) to go see this by some lovely, wonderful friends of mine and what started out as a clichéd chick flick left me feeling pissed off and bamboozled by the ending. I had seen the trailer to this movie a million times in the past weeks leading up to its release and never did any trailer I saw allude to what was to come in the movie. I thought I was going to have a lovely time with friends where we laugh at all the ridiculous things leading up until these two main characters get together (they ALWAYS get together) but by the end were in tears and angry (and not just at Anne Hathaway’s awful British accent). I can’t say what happens in the movie but if you are going in expecting la dee da roses and rainbows brace yourself because this is definitely not a movie to watch when you want something light. Overall I thought the movie was pretty good and typical, it’s just that the ending kind of killed the good feelings I had for it. For those who like this show, Wife of retired NBA player Speedy Claxton (who), Meeka Claxton is done. I guess VH1 decided to let her go. Basically the drama with her and Tami was too much and they chose Tami to stay on. In my opinion this show needs to die and Meeka needs to thank her lucky stars not to be associated with it anymore. I can’t stand it. I’ve watched maybe an episode or 2 and I just can’t handle women that look like me acting ridiculous like that. I’ll watch a Real Housewives of whatever (which is the same show but with less melanin) before I watch this show. It doesn’t even matter that she is gone. Shaunie O’neal and VH1 are just gonna find some other desperate NBA baby mama/ex-wife/eternal girlfriend/groupie to take her place. 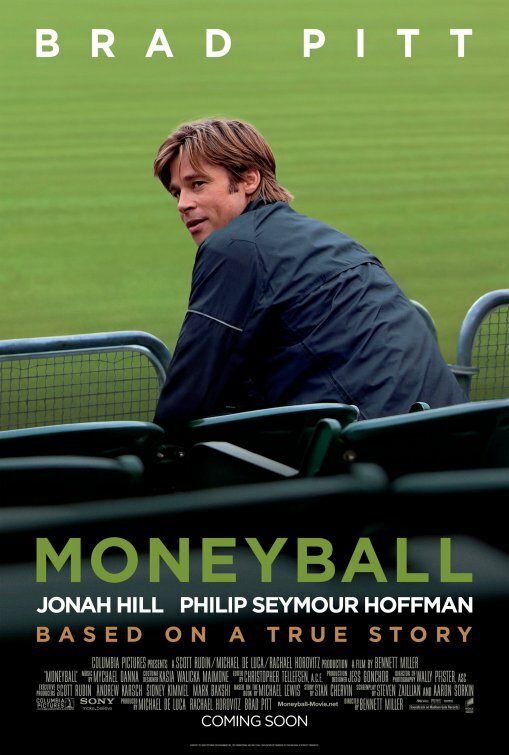 Moneyball is the new movie staring Brad Pitt, Johan Hill, Phillip Seymour Hoffman and a whole lot of other people. I saw this movie last night and didn’t even know it was about baseball (I clearly didn’t pay attention to the trailer). I’m not really a fan of the sport but I’ll say this movie was a good one. Its about this guy named Billy Beane, played by Brad Pitt, who is the general manager of the Oakland Athletics, which was one of the poorest teams in baseball. They didn’t have deep pockets and therefore couldn’t afford star players like the Yankees and other top teams could. The movie is the story of how he tried to get turn his cheap team into a winning one using an unconventional method with the help of Peter Brand, played by Jonah Hill. I haven’t really liked a movie with Brad Pitt since Inglorious Basterds. Granted I haven’t seen the last movie he was in, Tree of Life, but that movie just didn’t make me want to see it and you know I’ll watch anything. The movie had a kind of Jerry Maguire feel to it but not much. The movie is written by Aaron Sorkin (The West Wing, Social Network) and its got a nice cast with some good acting and a couple of good laughs. What else can you ask for in a movie. Let me just start by saying that this year’s VMA’s were definitely better than last year’s, very disjointed but better. I love Chelsea Handler but she wasn’t a good host. They should have just gone ahead and made Kevin Hart the host. I mean BET and MTV are under the same company so they should just make him the host of both the BET and MTV awards. The pre-show was just a hot mess of no names (Who the hell is Tyler The Creator) and ridiculousness (Amber Rose, Nicki Minaj) we’re not even going to dwell on. I will say that Beyonce announced her pregnancy at the pre-show and MTV didn’t even show it. They were too busy with Selena Gomez and Justin Bieber talking about his pet Johnson (Ughh).